Shannon David Hamons, Director of Economic Development/Building & Zoning in Harrison, Ohio, has released his first fictional novel. 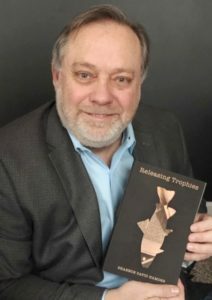 The book, Releasing Trophies is an account of a small-town newspaper publisher in dealing with his life-threatening disease and making unsettling discoveries about his father and others in his small home-town of Le Fleur, Ohio. The publisher, Frank Barnett, makes a trip to New York’s Niagara River region to confront the past and make discoveries about his father, and himself. Not everything he learns is comforting, but he gains a better understanding of how to deal with life’s struggles and how to forgive, and ask forgiveness. Hamons draws heavily on his own experiences growing up in small-town Ohio and working as a newspaper editor. He also recalls the richness of the many trips he has made to salmon fish the Niagara River and western Lake Ontario basin, and the charm of the New York towns of Lewiston and Youngstown. Hamons lives in Harrison, Ohio near Cincinnati with his wife Joy. He has nearly 30 years of public and private economic development experience, most in Ohio. Releasing Trophies is available at Amazon Books in paperback and Kindle formats. He has begun his second book, entitled Working, a humorous and sometimes poignant look back on his childhood odd jobs.